If you read the Q&A the US Postal Service issued earlier today on the massive data breach the agency suffered recently, you might have noticed a curious omission. The very first question is “How and when did the security breach occur?” Having asked the most obvious question, the USPS doesn’t actually answer it. There’s no explanation as to how the breach occurred, and the vague answer to the question “when” is just “recently”. Read more: Issa/Farenthold on Postal Service’s Security Breach | Committee on Oversight & Government Reform. Here’s an answer. The USPS, The USPostal Inspection Service, The Office of the Inspector General and the FBI have been watching for any hint of anything unusual happening with the data in order to gather further information on who did the intrusion in the first place. Kind of sounds like standard practice in the IT Security arena. 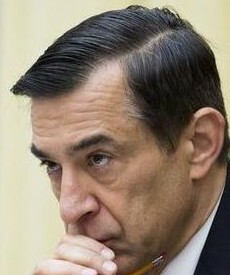 Thank God that this Issa-Hole isn’t going to be the chair of the oversight committee after January. He’s done nothing but bash and degrade anything and everything concerning the USPS during his tenure and is trying anything to push his privatization agenda through. Even against the will of fellow Congressmen, the USPS and the American public. Get over yourself little Napoleon and just slide back into obscurity when you no longer hold the cards. Wow truth, Did you just fall off the turnip truck? This is a manufactured scandal that is part of Issa’s plan to privatize the US POSTAL SERVICE where have you been? Almost every Employee is a Veteran! Not only are the Republicans cutting Retirement Benefits for Veterans in 2015 Now they’re Shutting down the US POSTAL SERVICE where non retirees earn a Living after Serving in the Military so that they can obtain the Federal Benefit that Issa and the rest of the HOUSE OF REPS Gets whether they work or not. How is it that Issa’s pension fund is guaranteed regardless of this 114th Congress being the least productive in HISTORY of the US? I invite you to check the Facts and while you’re at it Check Out Who are the Biggest Contributors To Issa’s ReElection Campaign Who’s Agenda is He Partisan with? I’ll Help, in case you didn’t know that its Published for ANY Who has the Fortitude to FACT Check before they RUN their Mouths with Lies Told On The “FOX NOT” News Channel & Various Radio Opinion Based Shows, even Sean Hannity Said his Show was ONLY HIS OPINION! UPS, FEDEX, PRIVATE MAIL DELIVERY CO. Need I Continue? Haven’t been back to this for a while but, more information has since come out about the delay in notifying us abouit the intrusion. Seems that they were indeed baiting the hackers with false information in the attempt to continue working to track them down, to see where the intrusion was coming from. You certainly have no chance at finding anything if you lock everything down at the first sign of a problem. You secure your systems and then make BS information available. You have to think like a hacker. Truly hide the good stuff but, leave the bait almost completely hidden. Challenges them to break in again, and you know they will. It came from shaking down the former owner of the car alarm company he took over and burning the warehouse down.